Having a sister guaranteed many things in life; lots of copying, toy sharing and fighting over who got to play Mary-Kate Olsen first. For the record it was always me but seeing how things turned out I am more than happy to give you the privilege now Becky. But the other fairly common tradition of sisterhood often assures you a spot as maid of honor and of course for me there was no question that my only sister Becky would get the job. Given that she’s had years of practice being my schlepper, therapist, voice of reason (although I’m still the big sister and 99% right), lady in waiting, defuser, stabilizer, reality checker and biggest cheerleader always; I am fairly confident in her abilities. I know she’ll make the perfect candidate to manage multiple Monica meltdowns and tell me I look like Kate Middleton. She’s going to do a great job of keeping me humble and making sure I have a great time because that’s who she is! So to make it a bit more special, I decided to give her a cute little box full of fun things, as many brides often do to ask their maids of honor and bridesmaids to be a part of the big day. I found the box at Tuesday Morning, which is a similar store to HomeGoods and T.J. Maxx They had a lot of options for cute decorative boxes and I would highly recommend looking for one there or a craft store like Micheals or Hobby Lobby. So I filled it with a lot of the usual things like brut rosè, candy and a nice card. I chose brut rosè for a few reasons, the primary being that I love it, but also because right after Arthur proposed, I said "yes" and then immediately heard a champagne bottle pop and when I turned around it was my sister Becky, holding a bottle of brut rosè. The other perfect coincidence is that this particular brand is called Graham Beck, which I swiftly crossed out and made "John Beck," as that was Becky's undercover name in Arthur's phone to coordinate the proposal. I also added a ridiculous vegan kale gourmet candy bar (yes they make it and yes it cost $10 welcome to LA), every season of The Nanny in DVD format (which my sister and I grew up watching religiously and taught us more than any teacher or cheerleading coach could have) and a live butterfly. Yes, you read that right. 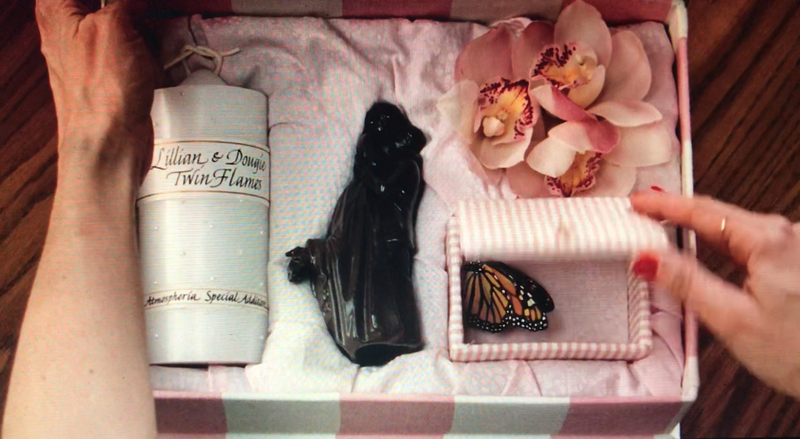 I went v extra and put a live butterfly in her box - inspired by the movie Bridesmaids when Kristen Wig’s character is invited to her friend's wedding shower in the most over the top way possible. Now before anybody gets concerned, there was no harm done to the butterfly. It was shipped on ice and hibernated until we released it. The butterfly slowly woke up with the warmth and then flew into the beautiful Chicago skyline! The company I worked with was great, and I would highly recommend if you’re interested! It made the whole experience extra fun and very special.